Several weeks ago we StageDudes got to discussing how much an entry-level system should cost. Eventually we decided that $1000 per component, or $5000 for a system, was the dividing line between mid-fi and hi-fi -- at least until someone reminded us how the Real World works (I think it was dB, who seems to retain close ties to reality, if not exact normality). In that far-away land, people eat, raise kids, have house payments and otherwise spend money that has nothing to do with audio. In short, unlike many audiophiles, they cant claim either Conrad or Johnson as a tax deduction. In that spirit, dB posited that $2000 for a system is the absolute upper limit we should consider. As for myself, while understanding his point, Im not sure I agree. Of course dB is right about the Real World. To the vast majority of people, even $2000 for a two-channel system is pushing it. A personal example: Several years ago a good friend of mine called from Vegas after he had hit two slot jackpots totaling $1500. He was excited because, "Now I can get a good stereo." To him, $1500 was more than enough to accomplish that goal. In the end, I was unable to help him try and fit a stereo into that budget because, on the way home from Vegas, he stopped at Circuit City and picked up a complete Kenwood surround system with enough left over to upgrade the VCR. And, according to dB, while thats not a high-end system, thats the way normal people act. On the other hand, I know college students who, having been exposed to the good stuff and in spite of their limited means, have put together solid, $4000-$5000 systems. And that extra $2000-$3000 really does make a significant difference. To these ears, those extra dollars may be the most important spent on a system. There are very, very few competent $500 speakers that Id take over a competent $1000 pair, but there are some superb $1000-$1500 models that more than hold their own with speakers twice that price. In short, to me the steepest and most satisfying part of the diminishing-returns curve is the $2500-to-$5000-system range. Not to beat a dead horse, but I find that systems of less than $2000 can be musical, or fun, or accurate over a small window, but no more than that. Also, where they err is either in terms of an unacceptably large sin of omission (for example, no bass), or sins of commission that are too egregious to live with. But double the budget and the improvement is both significant and obvious. Still, even a budget as high as (remember, were talking real world here) $5000 needs careful shepherding if it is to return full value. And to do that I often find myself looking at integrated amps to base a high-value high-end (dont you like that phrase better than "entry-level?") system around. By combining amp and preamp and eliminating an interconnect, more dollars can be conserved for high-quality source and speakers. All of which brings us to the Audio Analogue Puccini SE integrated amp. While Audio Analogue is a new entry in the US market, they have been around for a bit. Founded in 1995, they are headquartered in the Tuscany region of Italy. Still, it wasn't until CES 98 that I first heard of them. There, besides meeting North American distributor Richard Kohlruss, I also had the fortune of meeting one of the designers, Federico Paoletti. There are many ways to tell if you are talking to "real people" at audio shows, and Federico showed me one of the best. Even though we discussed at length his products and design philosophies, we spent almost as much time talking about his newborn son. Now thats what real people talk about. (Not that you should buy your audio equipment from real people, but then maybe you should. It would make for a nicer world). What sonically struck me when I entered the Audio Analogue room at CES was how cohesive and vibrant the sound was. Full of tonal shading, it was also of a single fabric top to bottom. And dynamic! The swings were superb given show conditions. And the look matched the sound. As I listened, I put a price on the gear -- $2000-$3000 per component. Was I shocked to hear that the preamp was $895 and the power amp only $1095! So, being the sly reviewer scum that I am, rather than deciding which of the two to ask for, I asked to try the integrated amp, figuring that by doing so I could listen to a combination of the preamp and power amp. Actually, the Puccini integrated comes in two flavors, the Puccini ($795) and the Puccini SE ($1150), with the difference being a second transformer in the SE model (notice that the reviewer-scum instinct made me ask for the SE version). This results in a power-amp section in the SE that puts out a conservative 50W into 8 ohms, as opposed to the 40W of the standard model (the SE is also rated at 80W into 4 ohms). That second transformer also moves the weight from 15 pounds to nearly 22. Both models, in fact all the Audio Analogue components, share elegant family looks, including 3/8"-thick faceplates. Finish is either satin black or brushed aluminum. The aluminum finish especially reminds me of what Jeff Rowland would put out if he were to design to for a price point about 50% lower than he does. Both integrated amps share the same input and output features and looks. Amazing at this price point, the preamp section is full featured, so all you vinylphiles can rejoice. 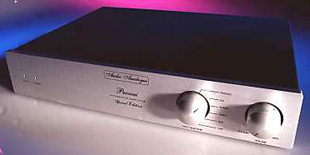 And even better, the gain on the phono stage can be adjusted for MM or MC cartridges. The other line inputs are designated tuner, CD, video, aux and tape. Outputs are tape, and to facilitate easy biwiring, dual pairs of CE-approved binding posts per channel. The only thing missing is a pre-out/main-in setup. Besides a rotary volume control and source-selection knob, which are mounted on the right side of the panel, the front fascia also has two lights on the lower-left corner. The first is a green power light. The second light indicates standby if you are in standby mode, which mutes the output to the speakers while keeping the amp circuits warm. Other than a company logo and model name in an elegant script, thats it for the faceplate as well as our tour of the Puccini. Next stop, the listening room. Most of you know the drill by now. New components break in and warm up in my office system. This gives each piece a low-pressure introduction to the Warnke household. It also creates odd combinations. For a brief period, the source in the back room was my portable CD player while the speakers were Dunlavy SC-IIIs. Odd bedfellows indeed. After a relatively long break-in time in the office, mostly due to other review components occupying the main room, I moved the Puccini SE into the reference system. There it was reunited with the Dunlavy speakers, but was paired with the Theta Miles CD player. Taking an $1150 integrated amp and making it the meat in a $8200 component sandwich can be careless, or folly, or genius -- if it works. In this case you can call me Einstein. Yes, this setup was, and is, a serious high-end system. Both the Theta and Dunlavy pieces are detailed and grain-free. So too the Puccini SE. In fact, the almost complete lack of any top-end colorations in this setup was astounding. And relaxing. I spent far too much time just listening without critiquing. Well, any time spent as a critic, as opposed to listening, is the actual waste. But by spending so much time merely listening, the review was delayed a bit. The midrange was also relaxed, while at the same time very communicative. You may not always put those two terms together, but I do. Overly hyped and etched systems may deliver the details of a recording, but unless that information is natural and not just a hi-fi artifact, communication is restricted to Joe Friday mode (just the facts maam). The Puccini SE scores very well in the detail category, falling just short of what I get through the Audible Illusions L-1 and Warner Imaging VTE-201S combo, but also is possessed of the naturalness that marks the great components. Bass in the above setup was tight and punchy, although not as powerful as when the Dunlavy speakers are powered by the Warner amp or the Blue Circle BC6. Extension was as deep as the SC-IIIs would go, and as deep as the Kharma Ceramique 2.0s would go as well when I put them in the system. But on the Kharmas, the little Puccini SE did get just a bit plummy at the deepest frequencies. For perspective, while short of perfection, I would call the control on the bottom very good for an integrated amp of $1150, much less an amp that includes its own preamp. Dynamics were lively, but as I mentioned above, lacked the full force of some of the more powerful and more expensive amps I have on hand. But more important, the micro level, the very life of live music, was expertly rendered. Staging was also very good to superb, only slightly breaking down when pushed by both large ensembles and high dB levels. Still, all these facts miss the real Puccini SE. Coherence and system synergy are often overlooked and underappreciated. Reviewers, like many audiophiles, can become so caught up in the micro detail level -- "Amp A not only allows me to hear the squeaks of the chairs in the violin section, it differentiates between the metal-legged chairs of the woodwinds and the wooden chairs of the brass section; while amp B goes that one better, allowing the oaken sound of those wooden chairs to fully develop, placing me not just at the conductors side, but actually under those selfsame chairs" -- that the focus of why we listen is lost. The Puccini SE returns this focus to its central place. The detail of the Puccini SE was such that I felt I was hearing everything that happened at a recording session, but the naturalness of expression was also such that I felt as much as I heard. Listening to the title track of new Cowboy Junkies disc, Miles From Our Home [Geffen GEFD-25201], I felt as well as heard the loneliness of the road and desire for both love and home in Margo Timmins voice. The quiet and resigned fear in "Good Friday" from the same CD was palpable in my listening room. The coherence with which the Puccini SE speaks was especially agreeable when listening to the recent Mobile Fidelity release of a live session by Harry "Sweets" Edison and Eddie "Lockjaw" Davis (In Copenhagen [UDCD 696]). With Kenny Drew on piano, the group alternates between ballads and mid-tempo tunes. The live recording is very good to superb, and the playing cooks. The Puccini SE placed me in Copenhagen (fortunately it was July so I didnt need a jacket) with an ease that astonished. For $1150 the Puccini SE is more than a bargain; its a steal. In the context of a $5000 system, it both delivers as much or more quality than anything it would be paired with, and frees dollars to spend on those other components. On an absolute scale it is detailed but relaxed, an open and yet sweet performer. The bass is very good, but is also the weakest part of the amp. Staging is better than you should be able to get for the price, while dynamics of the micro type are superb, and of the macro variety are punchy if ever so slightly short of full impact. The feature set is complete in every way but two: Id really like to see pre-out and main-ins so there is an upgrade path, and a remote would be nice. But if either of those toys would upset the perfect balance of the Puccini SE, Id pass on them. This integrated amp is very affordable in audiophile terms, even perhaps too cheap to be taken as seriously as it deserves. But over in the Real World, dollar figures account for something altogether different. They should account for more here in AudioLand as well. In this day of $15,000 speaker wire and $20,000 CD players, it is nice to find something that is affordable, sensible and also magical. The Puccini SE gets my heartiest endorsement and recommendation. Check it out. Simply put, it raises the bar for everyone else.